Euphorbia is a large genus of smooth and spiny shrubs and cactus-like succulents from 4” to 20 feet in the spurge family (Euphorbiaceae). 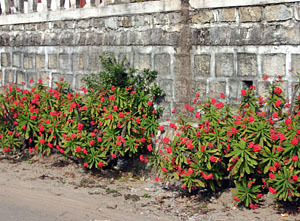 Of the more than 1,600 species (including poinsettia, castor bean and cassava), crown of thorns, E.milii is a smallish tropical species from Madagascar that has long been grown as a houseplant or ornamental in warm climates. Many cultivars and hybrids have been developed that vary in flower size and color. The species name milii honors Baron Milius, once governor of the island of Bourbon, who introduced the species into cultivation in France in 1821. The common name refers to a legend that this plant was used as the thorny crown worn by Jesus at his crucifixion. There is evidence that this plant had been brought to the Middle East before the time of Christ, and the stems are flexible enough to weave into a circle, but it is more likely that another plant was used as his crown. The species E. milli grows as a shrubby plant on a woody stem up to 3 feet tall. The variety splendens grows larger, 5-6’, and the hybrids are of various sizes. The greyish brown, branched stems, adapted for water storage, are 5-7 sided. The stem and branches are covered with prominent, 1″ sharp grey spines, although there are some clones that are nearly thornless. The new growth is sparsely covered with narrow succulent leaves. The smooth-edged leaves are 1½”long (some hybrids are much larger, up to 6″ long), obovate (wider near the tip) and are spirally arranged on the stem. The bright green to grayish green leaves naturally drop off as the stems mature, producing a scraggly appearance on older plants. The plant may completely defoliate when stressed (drought or high temperatures), but will later leaf out on new growth. 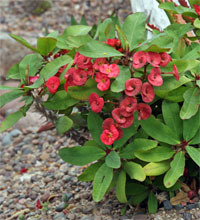 Typical Euphorbia-type inflorescences are produced throughout the year under ideal conditions. A specialized structure called a cyathium (fused bracts that form a cup) has a single female flower with 3 styles surrounded by five groups of male flowers, each with a single anther, and five nectar glands. Two of those 5 nectar glands have petal-like appendages that most people would consider the “flower”. On the species these are bright red, or yellow in E. milii var. tananarivae, which is often sold as E. millii var. lutea, but hybrids offer a variety of flower colors from white, cream and yellow, through many shades of pink and red. And some hybrids come in double forms. The flowers are generally produced in clusters (cymes) along the stem (axillary), but some selections bloom in terminal clusters. Sometimes poor flowering is due to too much light at night – these plants need darkness to initiate flowering. Crown of thorns is a quite tough plant in cultivation, taking extreme conditions and still looking good. Several species and cultivars in the E. milii complex were introduced into cultivation in the 1970s that were used in breeding to produce a wide range of plant forms and flower colors. Hybrids of E. milii and E. lophogona (which has long, leathery leaves) produced free-flowering plants with large, thick, deep green leaves. 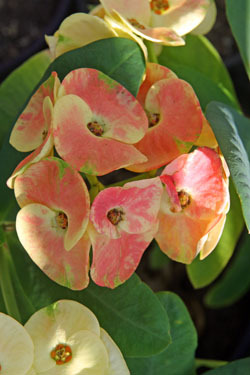 The California hybrids, developed for their stout stems and larger colorful flower bracts, are often referred to as “giant crown-of-thorns” series (e.g. ‘Rosalie’, ‘Vulcanus’, and ‘Saturnus’). German growers made selections of natural crosses in the wild similar to the California hybrids, but with thicker leaves and thinner stems, including varieties such as ‘Somona’ and ‘Gabriella’. The flowers, ranging in color from cream to various shades of pink and red, are often formed within other flowers. Many of these hybrids are patented, and many are marketed in very small pots, as they are tolerant of both drought and over-watering and bloom well in tiny containers. 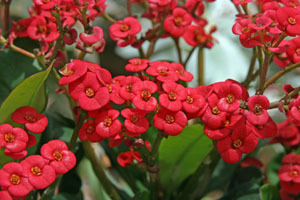 Short and Sweet™ is a compact dwarf cultivar with soft spines that is covered with small bright red bracts. 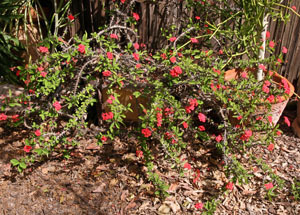 ‘Mini-Bell’ is another dwarf cultivar with a compact growth habit and lots of small red flowers. In the early 1990’s new, large flowered hybrids were produced in Thailand. These Thai Poysean hybrids were likely the result of a mutation, rather than selective breeding (Poysean is the name Chinese immigrants used for E. milii). The economic boom conditions of the time and demand for more exotic types of E. milii fueled the development of hundreds of cultivars, with a huge range of flower colors and plant sizes. Instead of just bright red or yellow, there were also many pastel shades, often with blends of different colors. And with cymes with more flowers, some looked more like hydrangeas than the typical crown of thorns. The form of these plants tends to be more upright and compact than the typical straggly-stemmed species, and the leaves are much larger and a brighter green. When the Southeast Asian economy crashed in the late 90’s, most of these cultivars were lost. Now there are only a few major growers near Bangkok that export these plants. The Thai hybrids are popular as collector plants but have not been successfully introduced in Europe or the US as mainstream flowering houseplants. There are many different cultivars available from specialty nurseries. A few include ‘Jingle Bells’ with soft pink bracts tinged with red and green; ‘New Year’ has buttery yellow bracts that change to cherry red as they age; ‘Pink Christmas’ sports cream bracts that develop pale pink and reddish streaks; and ‘Spring Song’ with creamy yellow bracts. These plants can be moved outdoors for the summer. To prevent sunburn, acclimate them gradually to the higher light levels outdoors. The plants will benefit from rain water, but be sure to remove any dead leaves or matted flowers during periods of prolonged wetness, so that fungal diseases will not develop. Any plant part that turns brown should be cut off immediately so prevent the rot from spreading further. Crown of thorns is quite tolerant of a range of conditions. This species prefers full, direct sun and average temperatures, but will grow in part shade (although flowering may be reduced). Some hybrids are better adapted to part shade. It will survive temperatures down to about 35F, so plants that are moved outdoors for the summer in the Midwest need to be moved indoors well before frost. It does well in low humidity, so succeeds in heated homes in northern climates. The species and varieties do best when the soil is allowed to dry between deep waterings. Many of the hybrids, however, do better with growing conditions more suitable for tropical foliage plants than typical succulents, and require more frequent watering. 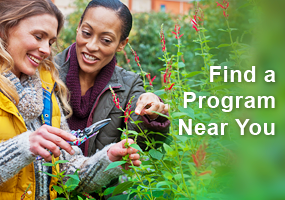 Fertilize lightly in spring and summer with a balanced fertilizer. Over fertilization will produce soft and vigorous vegetative growth and few flowers. E. milli is sensitive to boron, so be cautious about using fertilizers with high levels of micronutrients. 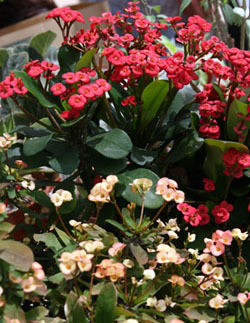 Most types of crown of thorns can be kept in small containers to keep the plants more compact, and will bloom even with restricted root room, but some of the hybrids need larger containers. Repot only when the plant outgrows its container, and replant using a rich, well drained planting medium, such as a commercial cactus mix amended with additional perlite, pumice, sharp sand or gravel and a little extra composted manure or other organic nutrient source. The plant can be set lower in the ground than its original level, particularly if the plant becomes too tall for the container (or to hide the graft union on some of the grafted hybrids). Replant in spring or summer when the plant is growing vigorously. Plants can be pruned to keep their shape and size. The milky sap will stick to and gum up cutting implements, so it is best to use a knife that is more easily cleaned, rather than shears. 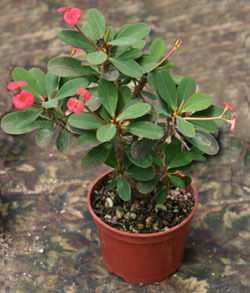 As with other Euphorbias, the copious, sticky, milky sap can cause dermatitis in susceptible individuals and temporary blindness if enough gets in the eyes, and is poisonous if ingested, so use caution when trimming or propagating this plant. 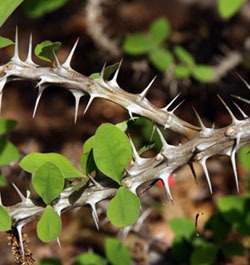 Also beware of the sharp thorns! Cut the stems back to axillary buds to increase branching and a more compact habit, or remove entire branches back to their base to open the plant up. Remove weak or thin branches first to improve the vigor of the plant. Hybrids tend to need less pruning than the species, as they have been bred to be more branched and compact. This plant is easily propagated from prunings or stem cuttings. Remove 3-6″ terminal sections and dip the cut end in cold water or powdered horticultural charcoal to prevent the milky sap from running excessively. Allow the cuttings to dry for 2-3 days before placing in well-drained planting mix (such as sharp sand, perlite and peat) to root. 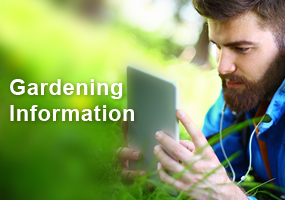 Keep the medium just barely moist – if too dry the cuttings will not root, but if too wet they may rot. They should root in 5-8 weeks when temperatures are warm. Potted crown of thorns often become run-down looking after many years; these plants are best discarded after establishing cuttings to replace the original plant. Plants can also be propagated by V cleft grafting using a 2-3″ stem tip on a 2-3″ stump, with ¾” matching wedges. Plants can also be grown from seed, but plants rarely produce seed without hand pollination with different plants. Crown of thorns has few serious pests. Mealybugs are the most common insect pest in the Midwest, but spider mites, scales and thrips may occur. 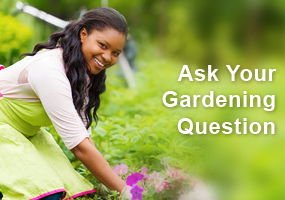 Diseases generally are the result of too much water, either in the soil or on the foliage. Interesting plants but those thorns! It’s all I can do to get ready for buckthorn season. I do appreciate those who continue to grow and tend to these plants, just not for me. I have never found this plant to be very attractive. And after reading this article I feel there are too many health hazards involved in growing it. Not a fan I guess. Not a fan of this plant to thorny, it does boggle my mind that plants from the 1800 are still around in some form. It probably has its place in the landscape somewhere. Question: Can I also take segments or does it have to be end cuttings? I have had a crown of thorns for years given to me by a gardener friend. Although it does flower, it is tall and leggy. The section on pruning was helpful as I can see I need to cut back to increase branching and have a more compact plant. Good to know when handling, the milky sap is poisonous. My friend gave me a crowned of thorns a few years ago. I repotted it twice and it has never bloomed since I’ve had it is there something I should be doing to get it to bloom? very informative info. This is my first dealing with crown of thorn plants. Some purchased that are tall and lanky. I bought a crown of thorns about a month ago. When I bought it the flowers were a deep pink, other flowers came up light pink & now it looks like the new flowers coming up are white. Am I doing something wrong??? Please help! how are the woody branches formed on plant – crown of thorns- ? I have many Crown of Thorns. Doing maintenance on them I’ve notice so many differences between them. Would love to learn the different species. Any ideas where I can get this information? I think the original in the wild with the little tiny leaves are pretty but I don’t see them at the nursery.